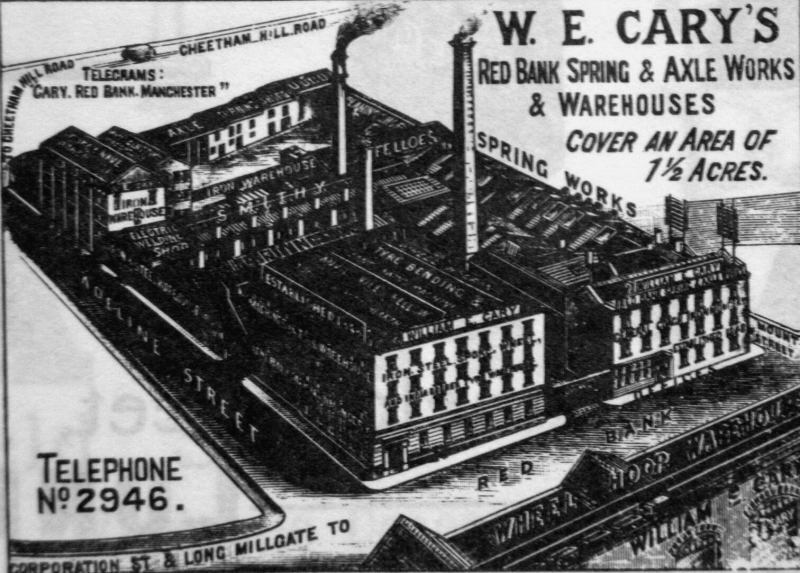 of Red Bank Spring and Axle Works, Manchester. 1863 William Cary listed as coach spring and axle-tree maker, Mount Street, Red Bank: House 18 Stanley Street, Red Bank. 1871 Employing 40 men and 8 boys. 1881 Employing 60 men and 6 boys. 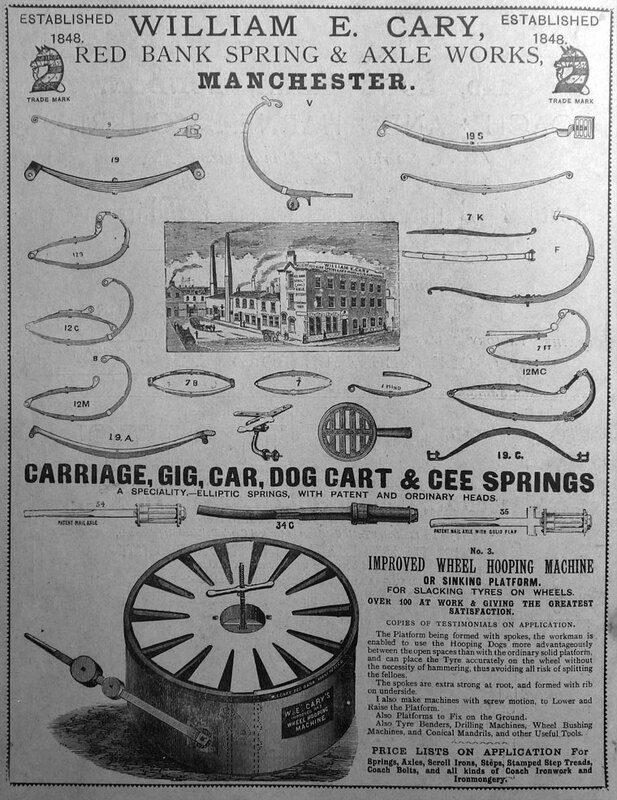 1901 Advertising a wide range of springs, axles and other ironwork for horse-drawn vehicles. Premises at Red Bank, Adeline Street and Mount Street. 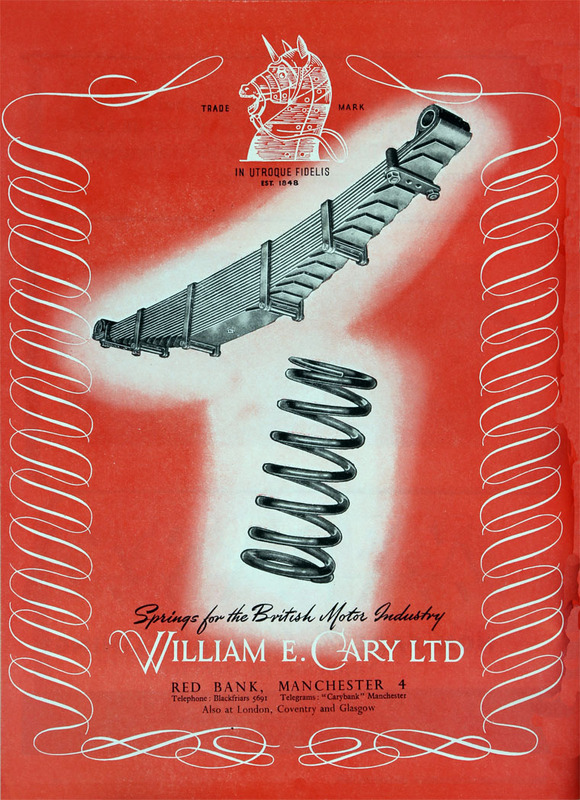 Advertisements proclaimed that 'All my springs are made from guaranteed steel and undergo a most severe steam test before leaving my works'. 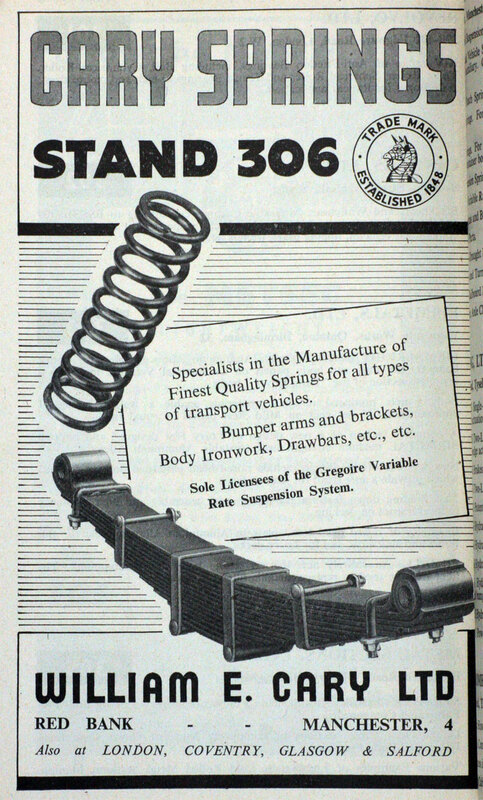 The 'steam test' would involve compressing the spring to a specified degree in a special machine with a steam-operated loading ram. The process is known as scragging. An advertisement, c.1900, (see image) shows the works, looking towards the north west. The imposing frontage was on the street called Red Bank (named after the sandstone bank of the River Irk). To the left was Adeline Street, and to the right was Mount Street (named Axle Street on the 1915 O.S. map). Behind the works was Fernie Street, and then Cheetham Hill Road. An interesting feature (for c.1900) is the presence of an 'Electric Welding Shop', to the left of the Smithy. In the foreground looms the 'Wheel Hoop Warehouse'. In fact, a railway viaduct dominated the area immediately south of Red Bank, so it may be that this warehouse was enlarged by the hand of the artist. 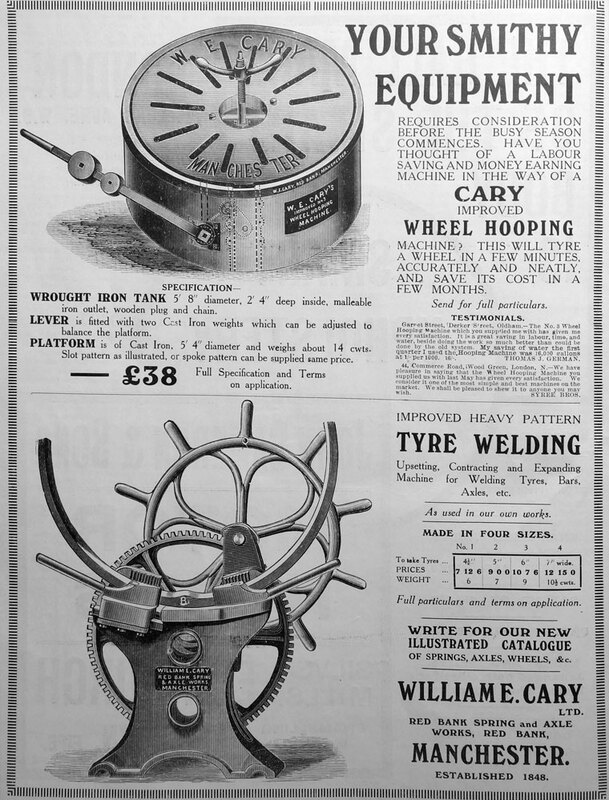 The c.1900 advertisement lists five warehouses on the site, for: Coach Ironmongery, etc; Wheel Hoops; Bent Timber, Wheels, Spokes, Felloes, India Rubber Tyres; Iron, Steel and Hoop Iron; Machinery and General Coach Ironmongery. The premises can be seen in a number of 1960s photographs. One shows what was probably one of the earliest buildings, the four storey mill-type building seen in the advertisement's engraving. 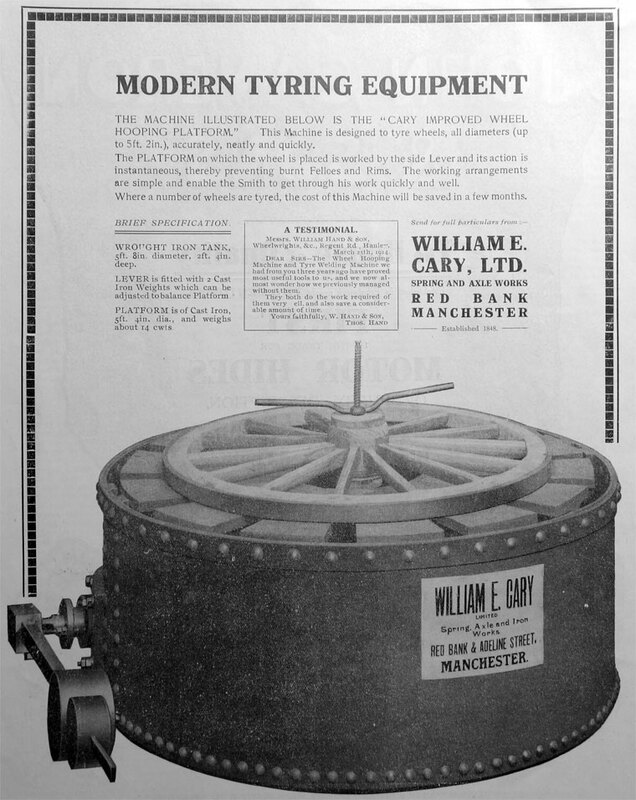 An advertisement on the Adeline Street wall announces 'Carefree brand' trays and trolleys. Another photograph shows the view from the offices looking down Adeline Street from Fernie Street. Another view shows the view looking up Fernie Street, emphasising the rather inconvenient topography of the site. 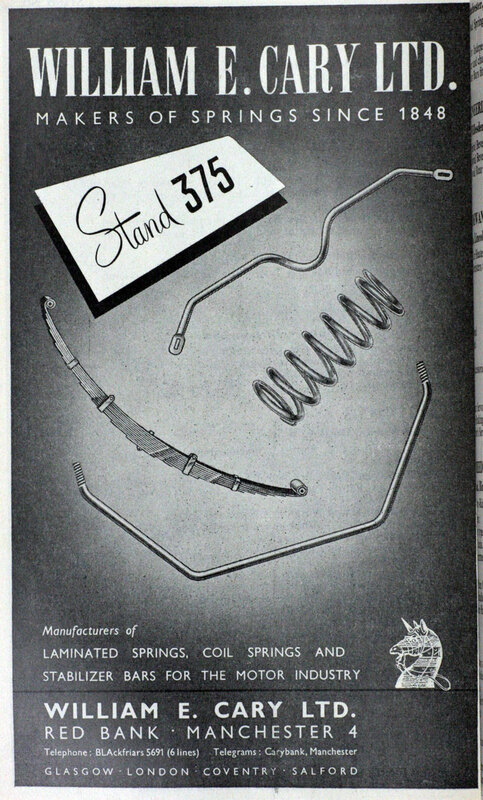 The factory can also be seen in the background in some 1936 photographs. One has a number of points of interest. 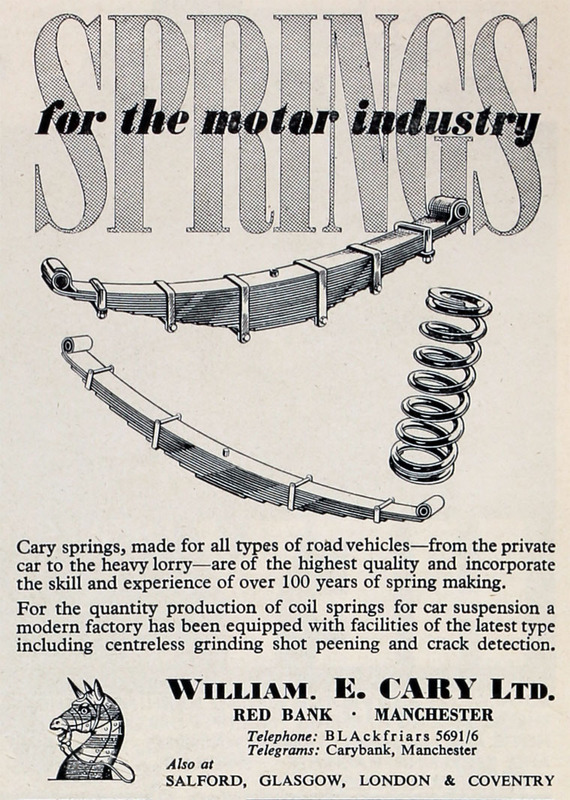 The Adeline Street facade is shown, and a sign proclaims 'Cary's Motor Spring Works'. Some time had evidently passed since its windows were last cleaned! To the right (eastwards) is the foundry of Henry Wallwork and Co. In the right foreground can be seen a turntable and small engine shed on the viaduct of the former L&YR Whitefield & Radcliffe branch line. Below this is the River Irk. The walled area which housed the turntable can still be seen (2015). A slightly different view shows a narrow group of buildings at the foot of the railway viaduct. 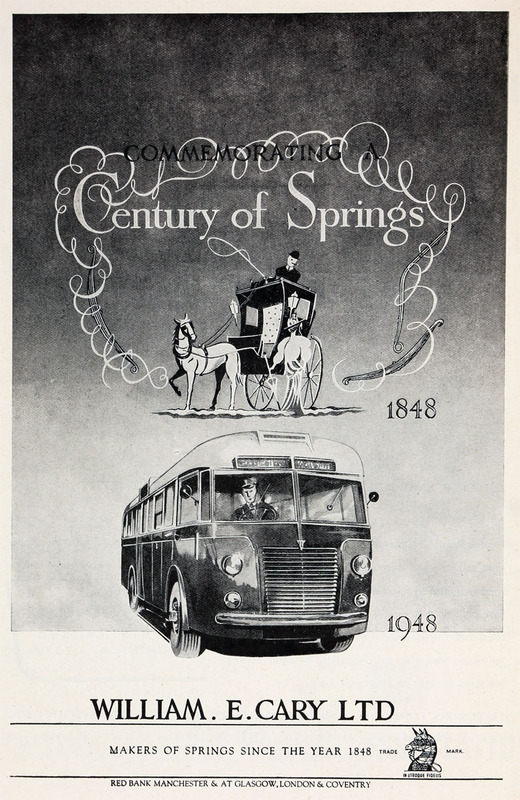 These may be the ones imaginatively represented in the c.1900 advertisement. This is perhaps supported by another view, looking south, in which can be seen some tyre hoops by a doorway. Another atmospheric 1936 photograph shows the works in the distance. Note the imposing height of the Flower Pot Inn's chimneys! This page was last edited on 26 April 2017, at 11:32.